I'm out of town next week so I thought I would make this post a little early. This is a photo of Eugene R. Black Sr. (and his wife). Black was president of the World Bank from 1949-1963 and head of the Brookings Institution from 1963-1968. Black is known for his writings on economic prosperity being a prerequisite for political freedom. His father (also named Eugene Black) was a governor of the Federal Reserve Bank of Atlanta and head of the Board of Governors in 1933 during the Great Depression. While in Atlanta, he was known for having provided easy and fast credit to banks experiencing bank runs. This is largely thought to have kept these banks open. Here's the post from Trent Reznor of Nine Inch Nails. Reznor offers some interesting ways to stop scalping (e.g., printing names on tickets) and some thoughts on how the ticketing agencies will change with future consolidation (e.g., auctioning tickets). It's the altruism paradox: If everyone in a group helps fellow members, everyone is better off--yet as more work selflessly for the common good, cheating becomes tempting, because individuals can enjoy more personal gain if they do not chip in. But as freeloaders exploit the do-gooders, everybody's payoff from altruism shrinks. All kinds of social creatures, from humans down to insects and germs, must cope with this problem; if they do not, cheaters take over and leech the group to death. So how does altruism flourish? Two answers have predominated over the years: kin selection, which explains altruism toward genetic relatives--and reciprocity--the tendency to help those who have helped us. Adding to these solutions, evolutionary biologist Omar Tonsi Eldakar came up with a clever new one: cheaters help to sustain altruism by punishing other cheaters, a strategy called selfish punishment. "All the theories addressed how altruists keep the selfish guys out," explains Eldakar, who described his model with his Ph.D. thesis adviser David Sloan Wilson of Binghamton University in May 2008. Because selfishness undermines altruism, altruists certainly have an incentive to punish cheaters--a widespread behavior pattern known as altruistic punishment. But cheaters, Eldakar realized, also have reason to punish cheaters, only for motives of their own: a group with too many cheaters does not have enough altruists to exploit. As Eldakar puts it, "If you're a single selfish individual in a group of altruists, the best thing you can do evolutionarily is to make sure nobody else becomes selfish-make sure you're the only one." That is why, he points out, some of the harshest critics of sports doping, for example, turn out to be guilty of steroid use themselves: cheating gives athletes an edge only if their competitors aren't doing it, too. Although it is hypocritical for cheaters to punish other cheaters, members of the group do not balk as long as they benefit. And when selfish punishment works well, benefit they do. In a colony of tree wasps (where workers care for the queen's offspring instead of laying their own eggs), a special caste of wasps sting other worker wasps that try to lay eggs, even as the vigilante wasps get away with laying eggs themselves. In a strange but mutually beneficial bargain, punishing other cheaters earns punishers the right to cheat. In the year since Eldakar and Wilson wrote up their analysis, their insights have remained largely under the radar. But the idea of a division of labor between cooperators and policing defectors appeals to Pete Richerson, who studies the evolution of cooperation at the University of California, Davis. "It's nothing as complicated as a salary, but allowing the punishers to defect in effect does compensate them for their services in punishing other defectors who don't punish," he says. After all, policing often takes effort and personal risk, and not all altruists are willing to bear those costs. Corrupt policing may evoke images of the mafia, and indeed Eldakar notes that when the mob monopolizes crime in a neighborhood, the community is essentially paying for protection from rival gangs--a deal that, done right, lowers crime and increases prosperity. But mob dynamics are not always so benign, as the history of organized crime reveals. "What starts out as a bunch of goons with guns willing to punish people [for breaching contracts] becomes a protection racket," Richerson says. The next question, therefore, is, What keeps the selfish punishers themselves from overexploiting the group? Wilson readily acknowledges this limitation of the selfish punishment model. Although selfish punishers allow cooperators to gain a foothold within a group, thus creating a mix of cheaters and cooperators, "there's nothing telling us that that mix is an optimal mix," he explains. The answer to that problem, he says, is competition not between individuals in a group but between groups. That is because whereas selfishness beats altruism within groups, altruistic groups are more likely to survive than selfish groups. So although selfish punishment aids altruism from within a group, the model also bolsters the idea of group selection, a concept that has seen cycles of popularity in evolutionary biology. What is more, altruism sometimes evolves without selfish punishment. In a software simulation, Eldakar and Wilson have found that as the cost of punishing cheaters falls, so do the number of selfish punishers. "When punishment is cheap, lots of people punish," Wilson explains. And among humans, there is no shortage of low-cost ways to keep others in line--from outright ostracism to good old-fashioned gossip. Here's a photo of the trading card for Kenneth Arrow, winner of the 1972 Nobel in economics. I have a set of these cards. A friend of mine actually has the set with most of the cards autographed. The new Gallup-Healthways Well Being index is available. The index is an attempt to “measure what it is that people believe constitutes a good life, who is feeling good about life, and who is in need of a helping hand,” and has 6 sub-scales: life evaluation, emotional health, physical health, healthy behavior, work environment and basic access. People in Utah report the highest levels of well-being; Wes Virginia the lowest. There is only a small (but statistically significant) positive relationship between median income and well-being. My home state (California) falls behind Wyoming and Utah. In terms of healthy behavior (one of the many reports you can generate from the survey's web page) is lowest in the southern states. In terms of emotional health, those states closest to the Canadian border score higher than do those in the south. The Canadian Institute for Advanced Research has a group that studies well-being and happiness. In a previous post I put up the details (and its supporters from the economics profession). Today, the act was discussed and debated on Democracy Now. The guest providing the discussion are James Sherk (Bradley Fellow in Labor Policy at the Heritage Foundation) and Stewart Acuff (special assistant to the president of the AFL-CIO). From the Life magazine library by Google Images: "Nikita S. Khrushchev speaking at the Economics club dinner (NY, NY, 1959)." I'm dying to know which economics club got him as a speaker. Is this really a degree? Mike Brocken, Senior Lecturer in Popular Music at Hope, said 'There have been over 8,000 books about The Beatles but there has never been serious academic study and that is what we are going to address. 'Forty years on from their break-up, now is the right time and LIverpool is the right place to study The Beatles. This MA is expected to attract a great deal of attention, not just locally but nationally and we have already had enquiries from abroad, particularly the United States. For further information, please call the postgraduate enquiry line on 0151 291 3389. I've always been interested in how symbols affect judgment and decision making. From a marketing perspective, that's the whole game. If you think back to the Great Depression, the National Recovery Agency (the NRA) had a logo. 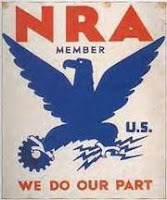 The logo had a blue eagle (a symbol of strength, the U.S.'s national bird) holding a gear (a symbol of industrialism). The red, white and blue of the poster further tied the NRA directly to the U.S. The logo was displayed in various businesses. Businesses not displaying the logo were often boycotted. By most measures, it was a successful marketing campaign (and a largely successful recovery). So now we have a new recovery effort in the U.S., and a new logo. The Obama administration, in an effort to maintain transparency regarding the stimulus measures taken, has set up a new web site which has a new logo. The logo displays a portion of the US flag, along with a gear (industrialism) and a leaf (agriculture, maybe green technology). We'll see how things play out and how the logo comes to represent the recovery effort. Only time will tell if this is as good of marketing as that used by the NRA. As people start grappling with the recession, they look for means of saving money. This usually means cutting back on purchases and holding on to items a bit longer than maybe one would in more abundant times. Calgary's social agencies are issuing calls for donations of household items as the recession begins to pinch city residents. "We've noticed that people are not going out and buying new things; they're hanging onto what they have," said Sparrow. "We're also seeing new faces in our stores." At the same time, the agency has experienced a 20 per cent increase in demand for its Free Goods Referral program. Women in transition or coming out of a crisis are referred to the program by one of 60 community agencies and provided a voucher to obtain clothing and household items at a Women In Need thrift store. Sparrow's organization especially needs dishes, pots and pans, linens, flatware, as well as clothing and accessories, she said. Its Dover-area store also takes furniture. "We're hoping that when people start thinking about spring cleaning, they think about us and donate," said Sparrow. It's an about-face from the boom, when thrift stores struggled to cope with a flood of donations. Some turned donors away and a few hired security guards to prevent people from dumping unwanted goods on their doorsteps. Beth Heyd, operations manager of The Salvation Army's Thrift Stores, estimates donations of household goods have dropped by half. Normally, there'd be a dozen sofas in the furniture section of the Salvation Army's Horizon Heights stores at 36th Street and 32nd Avenue N. E., she said, but only one or two couches were available on Thursday. "My theory is that you'll give second thought to buying that new sofa if you're worried about getting laid off," said Heyd. Donations of used clothing remain strong, but she's noticed an increase in professionals, especially women, shopping for used business wear at the thrift stores. Likewise, the Calgary Drop-In and Rehab Centre put out a call for donations of linens for the 2,000 homeless people who pass through its doors every day. "We are in desperate need of towels and blankets," said Louise Gallagher, director of public relations and volunteer services for the drop-in centre. My wife and I did a big clean out of our closets today, taking several bags of clothing to a local thrift store. Next time you're struggling to get through your closet, think about doing the same.